Home / Patients / Root Canal Treatment / What is a Root Canal? Modern endodontic treatment is nothing like those old sayings! It’s very similar to a routine filling and can usually be completed in one or two appointments, depending on the condition of your tooth and your personal circumstances. Getting a root canal is relatively painless and extremely effective. You’ll be back to smiling, biting and chewing with ease in no time. A root canal (also known as an endodontic treatment) is a serious procedure, but one that specialists handle everyday. Before engaging in any type of dental work, it’s important to know the facts about root canals, from the procedure, potential pain, and price. 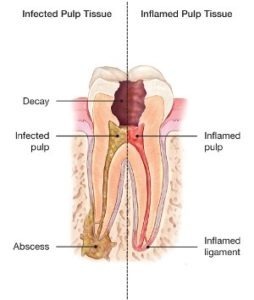 A root canal is the process of medically removing a seriously injured or diseased tooth. Also known as endodontic treatment, a root canal is the best way to relieve serious pain and make teeth healthy again. In addition to relieving pain, a root canal also helps protect surrounding teeth from excessive wear or strain. Since patients are given anesthesia, a root canal isn’t more painful than a regular dental procedure, such as a filling or getting a wisdom tooth removed. However, a root canal is generally a bit sore or numb after the procedure, and can even cause mild discomfort for a few days. Root canals are needed for a cracked tooth from injury or genetics, a deep cavity, or issues from a previous filling. Patients generally need a root canal when they notice their teeth are sensitive, particularly to hot and cold sensations. Sensitive teeth indicate that harmful bacteria are getting into the nerves of the jaw and must be removed. Can I go to school or work after getting a root canal? Although you will most likely be numb for 2-4 hours following the procedure, most patients are able to return to school or work directly following a root canal. However, most physicians advise against eating until the numbness is completely gone. If you work in manual labor, make sure to protect your teeth. Although it varies based on the type of tooth, a root canal takes roughly 90 minutes to complete per tooth. Most anterior teeth can be completed in one hour, while premolars and molars can take up to two hours to complete. For retreatment (being treated again), procedure times can change wildly. Although it depends heavily on your insurance and varies significantly based on the type of tooth, the average cost of a root canal can range anywhere from $500 to $2,000. Generally speaking, anterior (front teeth) tend to cost between $500 and $1,000, and molars (back teeth) costing upwards of $1,000. 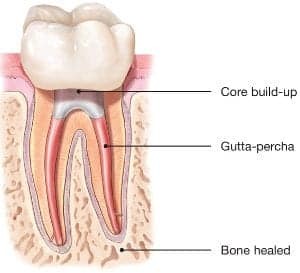 To learn more about what happens during root canal treatment, visit our Root Canals Explained page that walks your step-by-step through the procedure. Need a root canal? Don't be anxious. This informative video will walk you step-by-step through the procedure and explain how endodontists, the root canal specialists, can save your teeth. Concerned about the safety of root canal treatment? Watch this informative video to learn how endodontists perform millions of root canal treatments every year, safely, effectively and comfortably. View endodontic treatment information in French, Japanese, Portuguese or Spanish.